Each handmade purse is an authentic, original piece of craftsmanship. They are beautiful, yet practical. 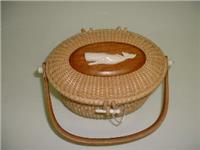 Our handmade purses are works of art that are durable and handy. 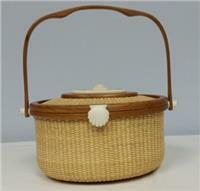 Each Nantucket purse is hand woven using rattan or cane onto cherry wooden molds with bases also made from cherry wood. 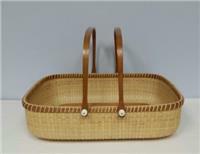 Our handmade purses are decorated with carved or scrimshawed pieces of cane or cherry wood, and the handles are made from cherry wood also, making for a sturdy design from top to bottom. We also will personalize your purse with your name or initials. A monogrammed purse makes a special gift for friends and relatives. 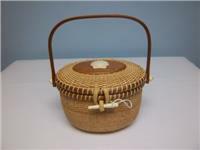 We offer a wide selection of classic Nantucket Lightship Basket purses and handbags, in several shapes and sizes. Because each purse is a handmade original, we are happy to work with you to create the specific purse you are looking for. Feel free to contact us with any questions you may have. The high-quality craftsmanship of our handmade purses and tote bags is guaranteed, and can only be found here at Nantucket Basketworks of Cape Cod.